Tommy Williams—a fisheries biologist whose enthusiasm bubbles forth so swiftly, he's often interrupting himself mid-sentence—is pacing on the banks of the Carmel River. "Amazing," he says, snapping pictures of newly formed sandbanks and twigs wedged in between white alder, black cottonwood and willow trunks. It's not the trees or twigs that delight him. It's the thundering flow of a river that has been dammed for the last 94 years—and the sediment (dirt and rocks) that are pushing everything downstream. Williams doesn't even mind that recent high flows have stripped out some of the tree tags he'd tied to branches along the river's edge to mark fish survey spots. 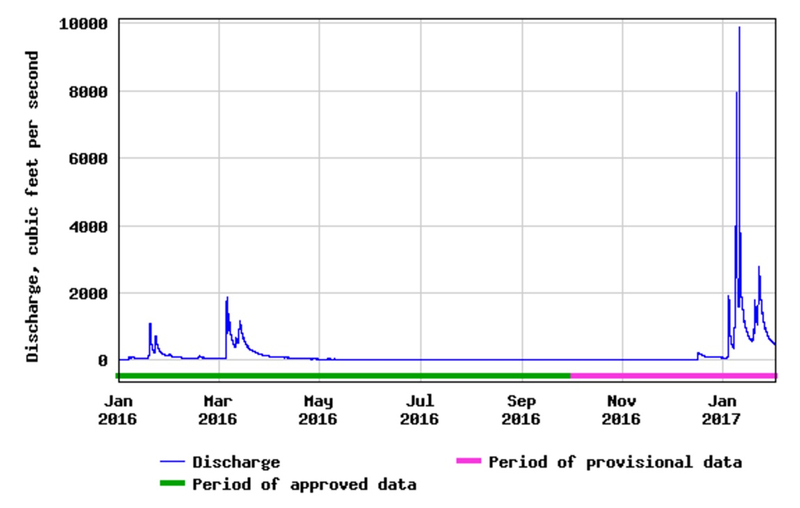 NOAA's collaborating agency, the USGS, has also lost several rebar survey markers (which designate geological study areas) to the floods. In fact, Carmel River flows in January were the highest they've been since 1998. That's due to winter storms which soaked the Carmel Basin with 25 inches of rain since the first of the year. At its peak, the river water was rushing by at about 75,000 gallons a second. That's 4.5 million gallons every minute, roughly enough water to fill six Olympic-size swimming pools. The water sent boulders and broken tree branches crashing onto a service road alongside the river. By mid-January, it became impassable. "It's kind of messy," says Williams. "But messy is okay." Actually, "messy" is crucial. The roots of upturned trees capture gravel, which provides essential spawning ground for federally protected steelhead trout. The back eddies and side channels next to the unearthed trees give fish a place to hide from predators like kingfishers and garter snakes. Or rest, as they make their long trek up river to spawn. The river hasn't been this messy since Woodrow Wilson was president. All that debris used to be trapped behind the San Clemente Dam, a concrete behemoth built in 1921 that became choked with silt and was eventually declared seismically unsafe in 1991. 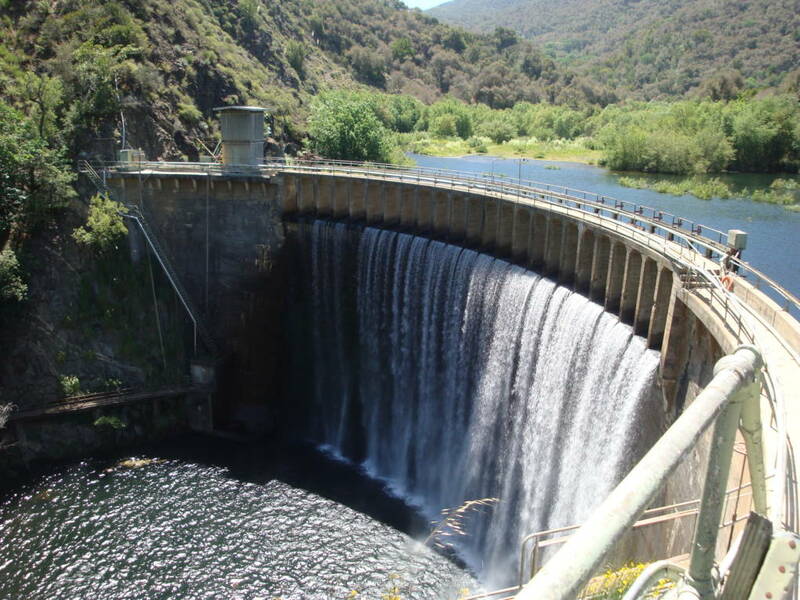 The dam crossed where the Carmel River and the San Clemente Creek naturally converged. San Clemente Dam stopped supplying water to Monterey residents in 2002, when it was 90 percent full of silt and there was only a sliver of storage capacity left for water. Cranes and bulldozers chipped away at it, demolishing the dam in 2015 after state and federal agencies decided it was too hazardous. If it were flooded or if an earthquake struck, up to 250,000 dump trucks worth of sediment could spew forth, suffocating anything living in the river. 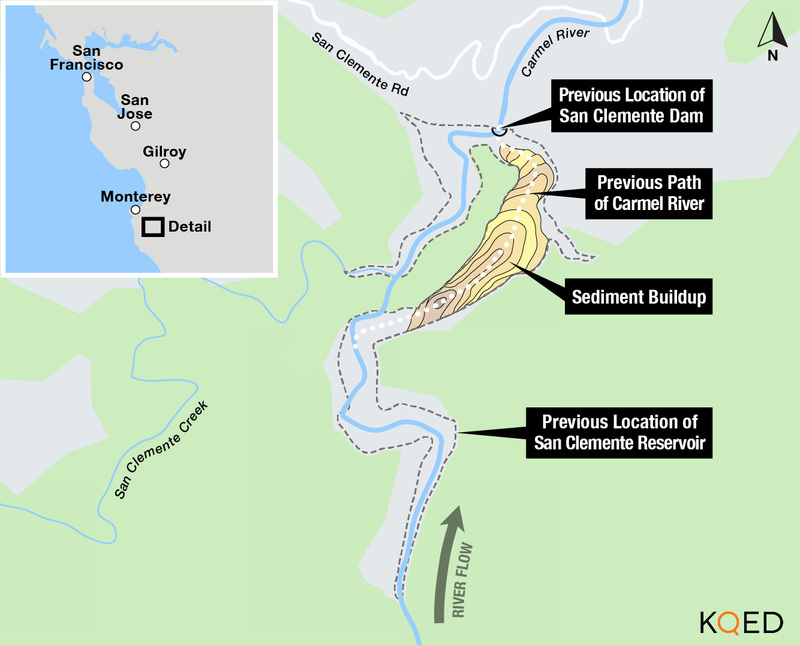 The project involved a major river reroute—getting half a mile of the Carmel to flow into an adjacent stream: San Clemente Creek. This allowed engineers to stabilize the built-up sediment behind the dam and cover it with grass and tree saplings. Trish Chapman, regional manager for the California State Coastal Conservancy, says the removal “seemed so much smarter than just slapping more concrete on a dam that no longer had any function." California American Water Company, the agency that owns the dam, could have retrofitted the structure for $49 million, which still would have presented problems as the dam weakened and aged. So for $84 million, the company tore it down. Now the Carmel River is flowing freely again, carrying sediment downstream that was trapped behind the 106-foot wall for almost a century. "Did I ever think we’d see dams coming down? Not really," says Williams. 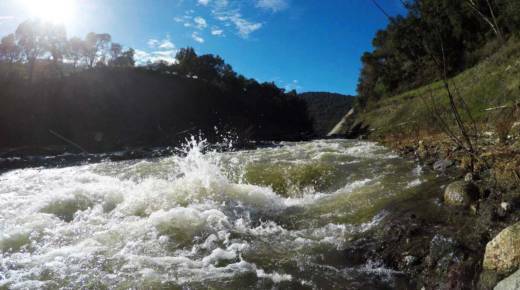 The biologist is also involved in the planned removal of four hydroelectric dams on the Klamath River. "So it’s a pretty exciting time," he adds. Exciting and historic. 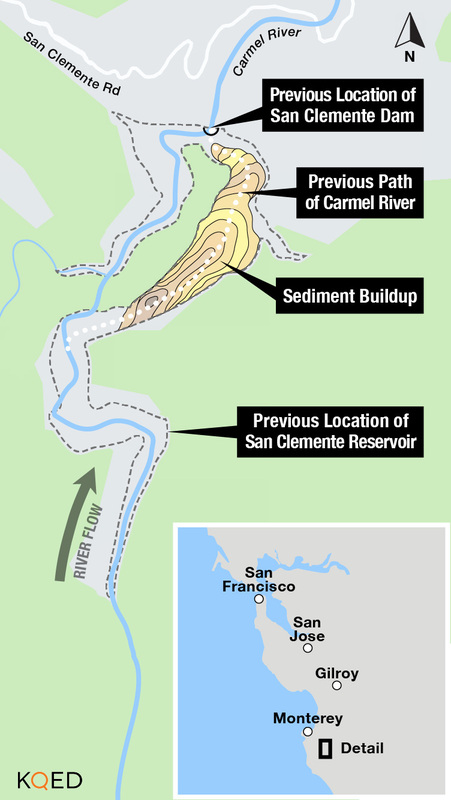 The San Clemente deconstruction was the largest dam removal in state history. Demolition of the dam opened 25 miles of upstream tributaries and creeks so that endangered steelhead can start to make their way up river to spawn. The old dam impeded the fish’s migration to and from the ocean. There was a fish ladder, but it was the steepest fish ladder in western North America. 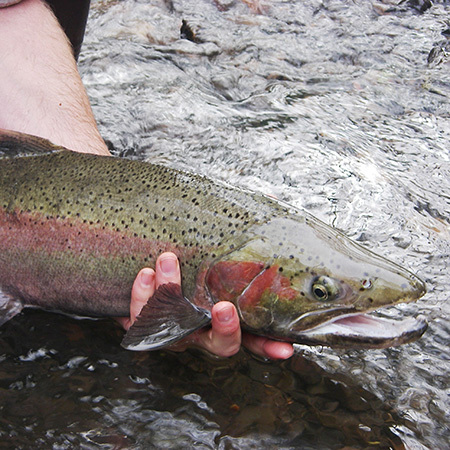 Over time, the steelhead population dwindled from 1,350 in 1965 to 249 in 2013, the year the dam closed. By 2016, the California State Coastal Conservancy was already seeing initial signs of recovery. Trish Chapman says fisheries biologists surveyed a “reach,” or section of the river they’d restored, and discovered steelhead nests above where the dam had been, evidence that the fish were making it past the old dam site. "Finding out last year that fish had made it up above the reach that we worked on... that was pretty exciting," says Chapman. Williams says it will take years, maybe decades, before the biologists know whether the river has fully repaired itself and the fish are coming back. "For me, extinction is not an option here," says Williams. "We have to say, 'what would we do to try to keep these fish around?'" For now, that means allowing the river to run its course. 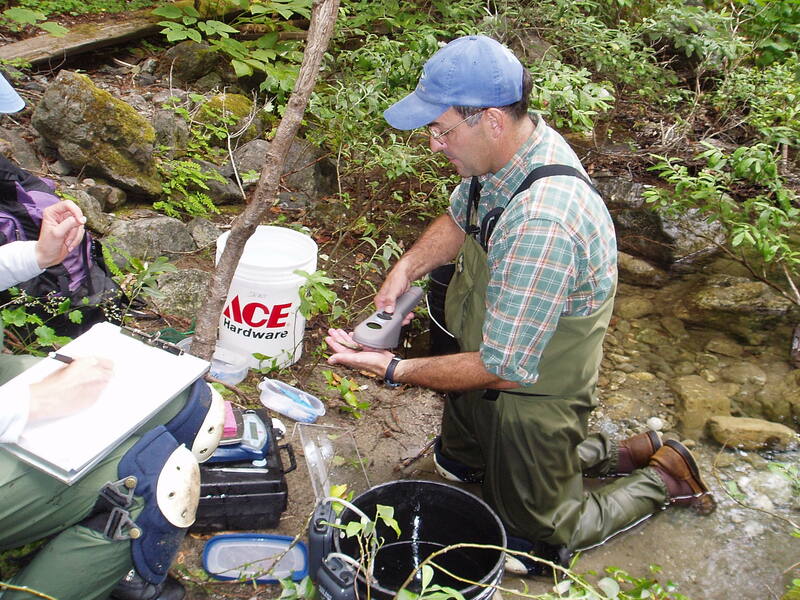 This summer, Williams and his team will return to tag and measure fish after the roaring rush of the river—fueled by winter rains—has finally slowed to a crawl.